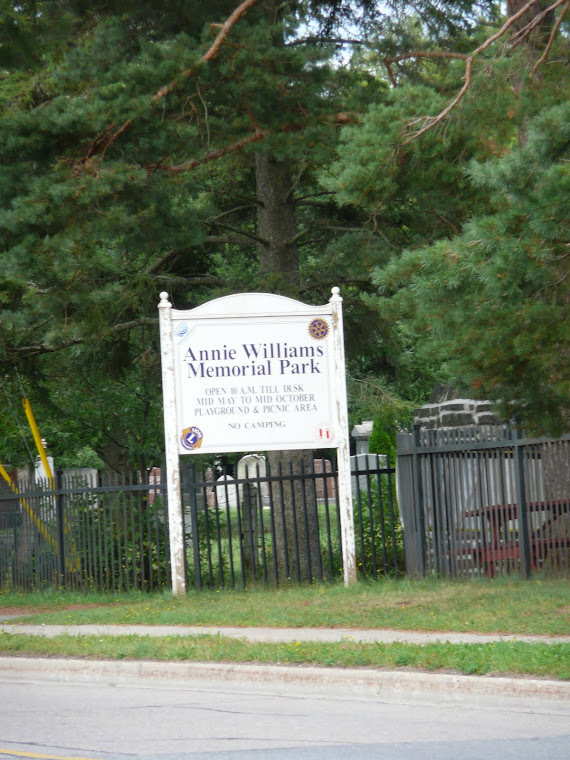 Annie Williams Memorial Park is located in Bracebridge, Ontario, the Heart of Muskoka, between Santa's Village Road and the Muskoka River. This beautiful serene 10 acre park features a dock and swimming beach, picnic shelter, amphitheater, and the newly built Brazier Family Memorial Playground. As host for numerous annual community events, Annie Williams Park is truly the hub of Bracebridge. Mark Sunday, May 28th, 2017 on your calendars for the annual Annie Williams Memorial Park Picnic. From 11:30 AM until 2:00 PM, this FREE event will be hosted by the Annie Williams Memorial Park Advisory Committee, which is comprised of members from the Bracebridge Rotary Club, Bracebridge Lions Club and the Bracebridge-Muskoka Lakes Rotary Club and the Town of Bracebridge. We will once again join forces for this fun family event. This year the YWCA will be hosting their annual "Walk a Mile in Her Shoes" at the park in conjunction with the Picnic. Please come out and join the fun! It promises to be a day full of fun for the whole family! 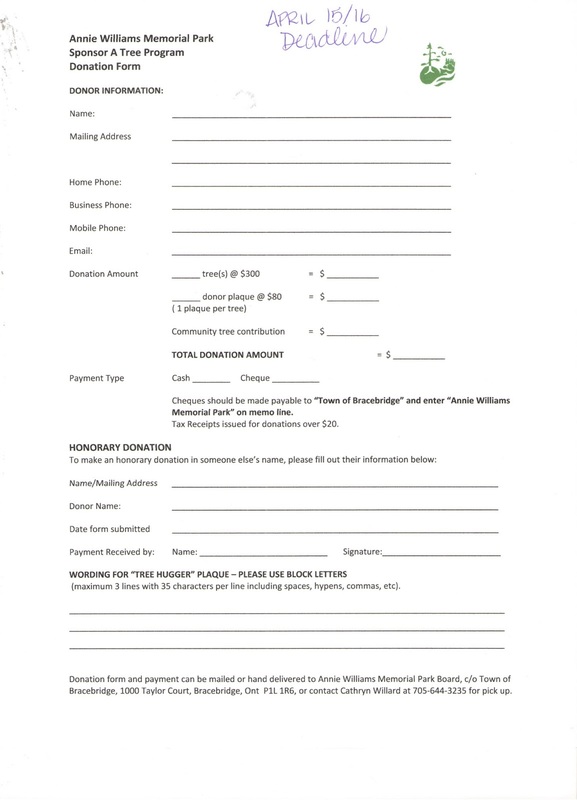 On Sunday May 29th, from 11AM until 2PM the Annie Williams Memorial Park Advisory Committee along with the Bracebridge Rotary Club, Bracebridge Lions Club, the Bracebridge-Muskoka Rotary Club and the Town of Bracebridge, once again join forces to sponsor the Annie Williams Memorial Park Annual Family Picnic. There will be hotdogs, cake, ice cream, popcorn and drinks, as well as balloons and activities for the kids. Children’s Entertainers “Jam Sandwich” with be at the Theater, the Bracebridge Fire Department, EMS and Lakeland Power will be there to show off their equipment and Santa’s Village will be doing free face painting. It promises to be a day full of fun for the whole family. Please come out and join us!! 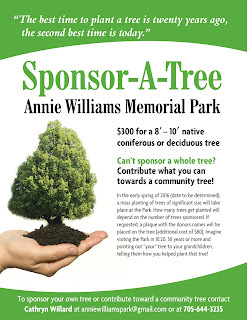 April 15th is fast approaching and all orders for sponsoring a tree at Annie Williams Memorial Park will need to be in by that date. Trees will are $300 and a "Hug a tree" commemorative plaque can be custom engraved for an additional $80. 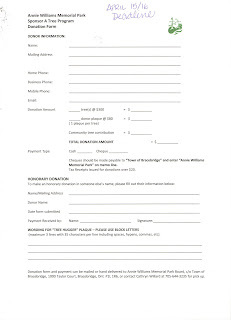 Please contact the town to get a copy of the form or email Cathryn Willard at anniewilliamspark@gmail.com to get a copy. 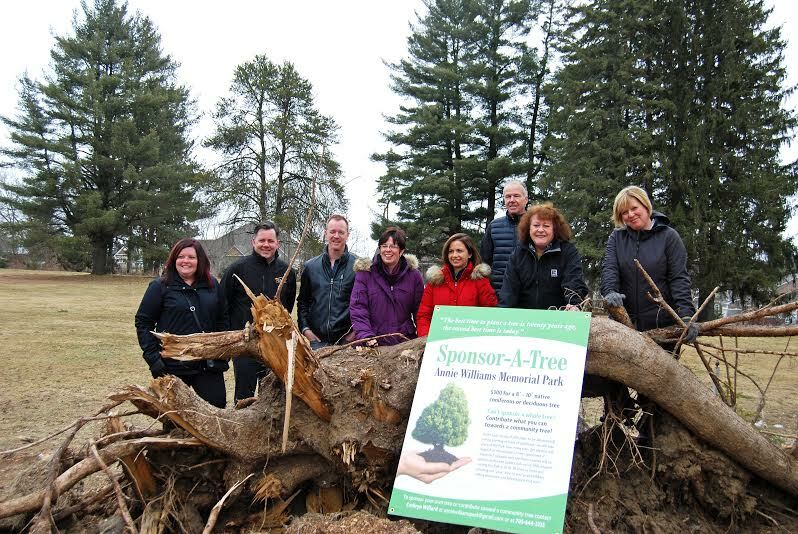 On Tuesday March 22nd, the Lakeland Association of Realtors presented Annie Williams Park with a $3800 donation to plant 10 new trees to replace those damaged in last year's severe weather. In November 2015 a tremendous wind storm destroyed over thirty mature, beautiful trees in Bracebridge’s beloved Annie Williams Park. The trees, some over 100 feet tall, were uprooted, broken or were left unsafe for the busy park. Responding to a call for help by the park’s volunteer Board of Directors, The Lakelands Association of REALTORS® has donated $3,800 to fund the purchase and planting of more mature trees in an effort to restore the park to its former glory. Established in 1926 by Bracebridge physician and philanthropist Dr. James Francis Williams in memory of his late wife Annie, the park has long been central to the vibrant community. While each year many young sapling trees are planted in the park, the loss of so many large and mature trees has greatly changed the park’s nostalgic feel. 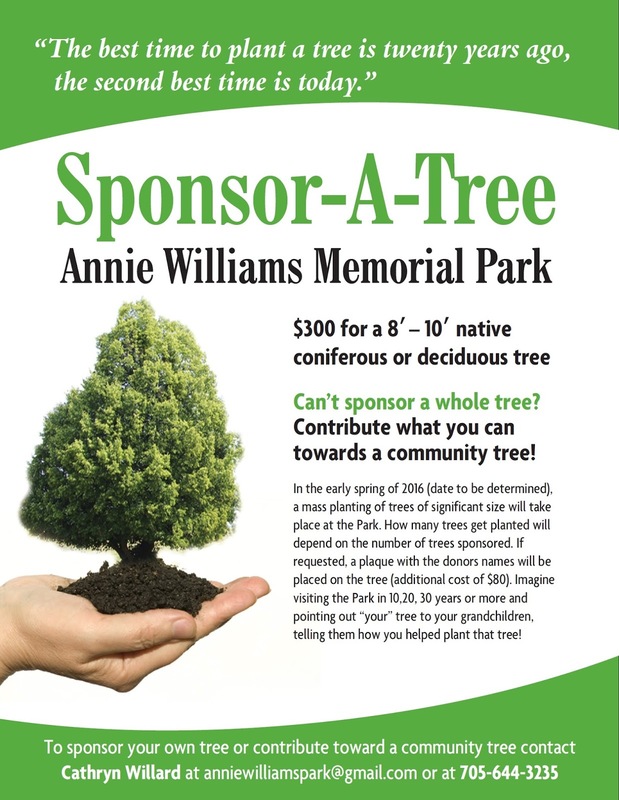 Starting in the spring, with the funds from The Lakelands donation, the Annie Williams Park Board will purchase trees of more significant size to replace those lost in November. 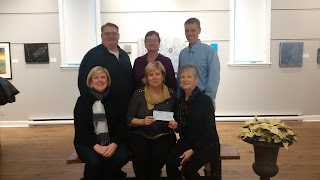 The donation to Annie Williams Park on behalf of local Realtors was presented to park Board of Directors Chair Cathryn Willard on March 22nd on-site at the park. Several members of The Lakelands were in attendance. The Lakelands Association of REALTORS® holds an Emergency Relief fund in their budget to help support significant causes across their area. The committee responsible for the fund considers tragic events throughout Almaguin, Muskoka, Orillia and Haliburton that require a quick injection of funds to prevent further impact. Muskoka Haliburton Orillia - The Lakelands Association of REALTORS® represents over 680 licensed real estate professionals within the heart of Ontario’s and Canada’s cottage country. Major geographical areas within the regions include the City of Orillia, and communities within the District Municipality of Muskoka, Almaguin Highlands and County of Haliburton. REALTOR® members throughout the region specialise in the trading of real estate representing different land use properties ranging from recreational, residential and commercial. 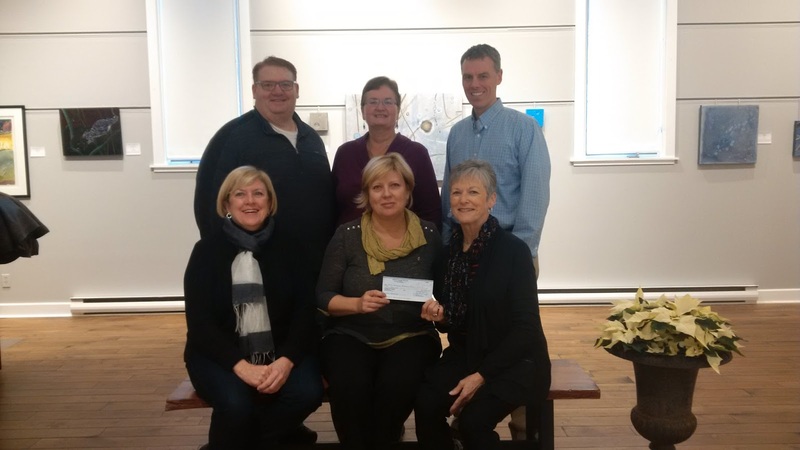 The Annie Williams Memorial Park Board was delighted to accept a cheque in the amount of $5000 from the Muskoka Arts & Crafts today. The two organization share a long history, with the Muskoka Arts & Crafts Summer Show being held in the Park for over 50 years. This generous donation was given in the wake of the recent storm that destroyed over 30 trees in the Park, and will be put to good use restoring the Park's canopy. 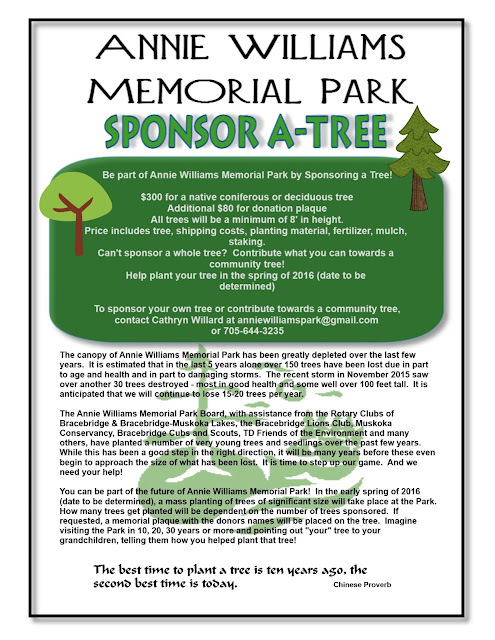 The following groups sponsor Annie Williams Memorial Park.